One of my all time fav intros. Impressive piece of code and design. Still remember the 1st time I`ve seen it... On friend`s C128D. Aaahhh, the infamous "hey son, this isn't Amiga you know! Really? Oh!" intro. Completely crazy intro, in a revolutionary way. If this intro didn't push the limits, I don't know which one did. Nice to see you around here. Not that much time ´right now. Just send me an E-Mail and I will reply! 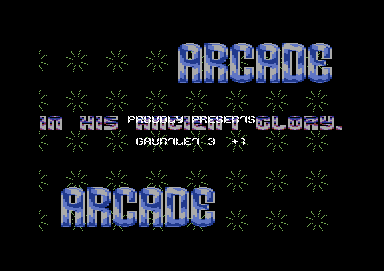 PS : I know that i got those missing Intros of Arcade somewhere, and also one or two that where never Released. Dont know exactly who gave them to me, maybe you Tyree or Jack Alien. Hi Tyree, also still alive ? Long Time not see, how is Life going for you ? CSDb - just go to the scener "Bacco"! Another of Bacco's great pieces of art.